Hello everyone, and happy Wednesday of Easter! 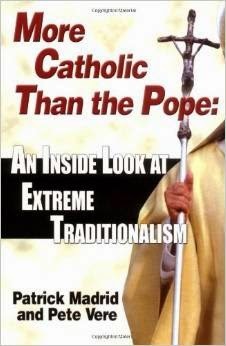 It's time for our April edition of the Catholic Book Club, and today we are slated to discuss More Catholic Than the Pope: An Inside Look at Extreme Traditionalism by Patrick Madrid and Pete Vere. I'll give you a quick overview, for those who haven't read it: there are three sections to this book. The first takes a chronological and analytical look at the Society of St. Pius X (SSPX), a traditionalist sect that many of us have at least heard of previously. The second part examines the SSPX's gripes against the Second Vatican Council, and the third part is a series of answers to frequently used arguments by extreme traditionalists ("Is the New Mass a 'Danger to the Faith'?"). The authors also include appendices of important documents mentioned in the book. Ok, sooooooo... This is a well written book. The authors clearly did their homework and provide solid, well researched arguments (all cited back to their original source) for why we can all feel comfortable with our loyalty to the pope and to the licitness of the Second Vatican Council. This is simply a much more academic book than I usually read in my free time. No personal, humorous anecdotes sprinkled amongst a tear-jerking spiritual memoir in this book, to be sure. :) I did find the story of the beginnings of the SSPX and Archbishop Lefebbvre interesting, but the academic discussion just didn't make the reading as fascinating as I'd hoped. I bought this book last year, slightly after Pope Francis was elected and news stories were popping up about traditional Catholics being unhappy with Francis' spirituality and approach to liturgy. 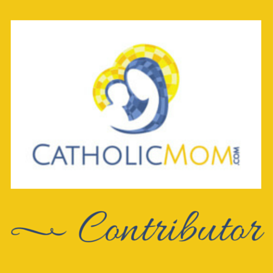 I became very interested in liturgical matters, and different Catholic interpretations of our faith. This book covers the topic admirably, and does so in less than 150 pages. The book does not bore us with unnecessary and tedious filler. But I have to admit to skimming a bit as I progressed my way toward the end. Although the topic is interesting, the book didn't hold my interest, if that makes any sense. It's certainly an excellent reference tool on this subject, however. Who else has read this book and has thoughts on it? Chime in please! That's a book I would love to read. If you haven't rubbed shoulders much with radical traditionalists, it might not be as interesting, but I have and do and would love more arguments against that kind of thinking. Not that I am tempted to believe them exactly. It's just that when they start bashing Vatican II, the Pope, etc., or trying to prove that the "modern" Church is different from the "traditional" Church, I start to wonder ..... maybe they're right! And if they are, the whole Church is false because the traditionalist "compromise" of believing only the pre-Vatican II stuff makes zero sense. 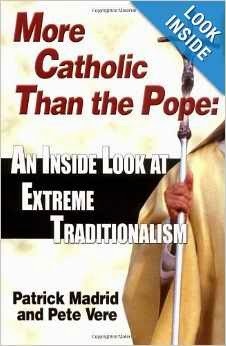 I know a lot of traditionalists who have wound up either in some sort of heresy or schism or becoming atheist. It does seem where that particular line of thinking leads. Hi Tiffany. Thank you so much for picking my book for the July selection. I'd love to do something for it- a Skype interview or something? Let me know if you're game. Cari! I will be in touch!